Reykjavík, a quarter to 5 pm, early August. A canopy of dark clouds covers the sky and cuts the vertical light. The sun is low, hovering over the sea on the fjord. 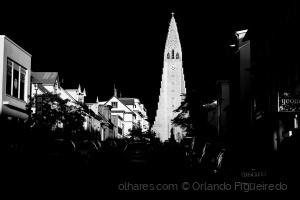 The horizontal rays of light coming from the bay hit the 74.5 metres high tower of the Hallgrímskirkja and leave the less apprised astonished with the ethereal view. A few minutes later rain was falling as if it would be the only thing capable of alleviating the apprehension of the elements. Nevertheless, night never came.